A family orientated festival in the beautiful Wicklow Mountains featuring organized walks, family fun days and canoeing events. There’s something for every taste with Roundwood Rhythm, Roots and Revival music sessions and side shows including butter making, competitions for children, body zorbing and a soap box derby. Friday evening kicks off with the Roundwood Fun Family Challenge where your level of fitness will have no bearing on who will be crowned Roundwood’s Fittest Family. The fun obstacle course challenges will be open to families to have a go and to try out do the opposing family on some more unusual challenges! If obstacles courses aren’t your forte why not try the arm wrestling! With music, there’s something for everyone and it’s all happening in Áras an Tochar from 7pm. The Roundwood Roots, Rhythm and Revival Festival will feature a traditional music session in the Roundwood Inn at 9:00pm with Roundwood Comhaltas Ceoltóirí Éireann. For those more interested in old-school country rock ‘The Spirit Rider’s, a Dublin based alternative country/urban twang 6 piece band will play the Coach House Inn from 9:30pm. Roundwood’s fantastic location nestled beside the Vartry Reservoir and surrounded by the Wicklow Mountains is the perfect setting for the following events which start from Roundwood Parish Hall on Saturday 19thof July. A range of walks from short rambles suitable for adults, families and grandparents to full hill walks are on offer. Choose from a ramble around Roundwood village pointing out all the points of historical interest which was a highlight last year, a hill walk from Crone Wood to Luggala or the Wild Child Walk a shorter expedition for intrepid nature detectives. A fee of €5 per adult applies which includes a light lunch in Roundwood Parish Hall for all participants. The canoe race on the Vartry Reservoir was another hit of the 2013 festival and so again this year, with the support of Irish Water Plc, the race will take place on Saturday evening at 5pm. The race is open to all aged 13 year and over and is fully supervised. Head down to the Upper Reservoir Dam to see how some of the land lubbers take to the water and cheer them on! Finish the partying on Saturday night in one of Roundwood five public houses where there will be plenty of music and fun to be had including ‘The Eskies’ from 6:30pm in An Tochar House followed at 10:00pm by ‘Coddle’. Sunday is a dedicated Family Street Festival from 3 to 7pm with field day events suitable for all age groups with music and dancing on the Gig Rig. The star attraction this year will be the BodyZorbing and the ever popular cow milking game! Side shows include Tug of war, Pilates & Scout Displays, Dog Show, Fair Day attractions, Pets Corner, Kid’s corner with face painting, tattoos, etc. Plants, crafts, home baking and more at Roundwood Home Producers Market will be available for sale in the Roundwood Parish Hall. Why not sample some freshly made bread with country butter following the butter making demonstration in the Hall. Come view the excellent work of the children who entered the cup cake decorating, monster maker, photography and handwriting competitions. There is still time to start working on your family scarecrow. The scarecrows will festoon the village throughout the weekend with prizes for the best and most original! 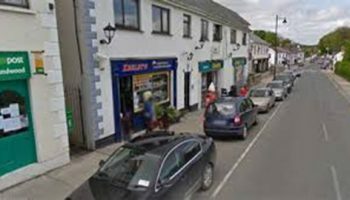 The bar mans race and milk churn race will take place during the day with Sunday evening’s street events closing with Roundwood’s first ever Soap Box Derby at Roundwood Bank. So before you start working on that soapbox check out the rules on the posters displayed in the village or on the www.roundwood.ie website. Wind down the weekend by checking out some of the local bars. If it’s more music you want head to the ‘Roundwood Sessions’ traditional musicians in Byrne and Woods or the ‘Roamin’ Cadillac’s’ performing in the Vartry House. 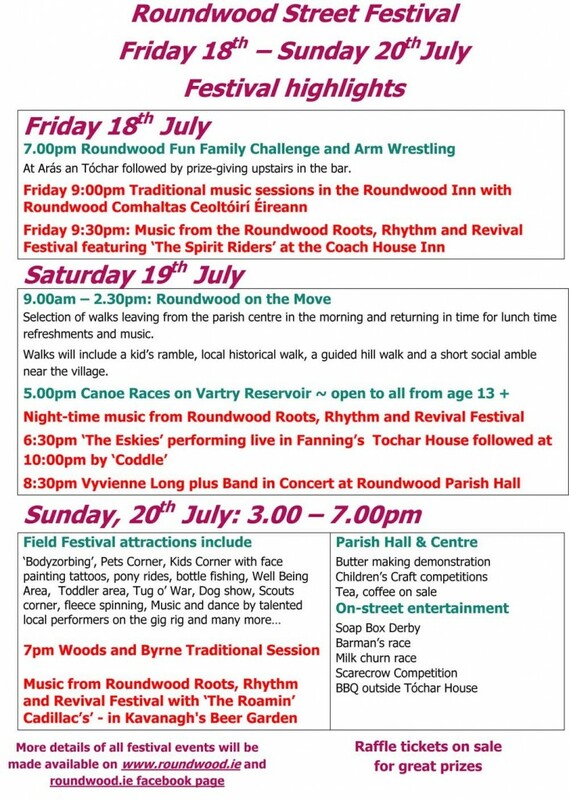 There’s something for everyone at the Roundwood Festival weekend so do come along. Further information on the Festival events can be found on the roundwood.ie or roundwood music facebook pages or on www.roundwood.ie website.